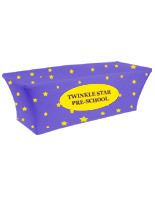 These fitted linens are definitely a perfect accessory for any special event or trade show. 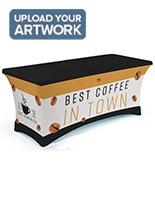 The full coverage, vibrant printing on these table cloths draws the attention of attendees from your competitors next door to your trade show booth. 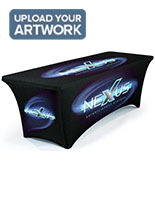 Have your company logo, advertisement or slogan printed on these table cloths for a huge impact. 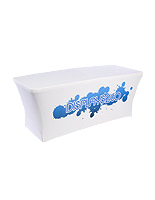 These table cloths, also known as stretch table covers, are perfect for any special event, tradeshows, conventions or exhibition halls. 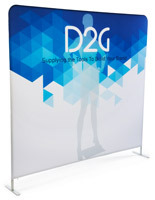 Make your booth look more eye-catching and appealing to attendees with these table cloths. These table linens, table cloths feature an open–back design, allowing staff members to sit behind the table easily. 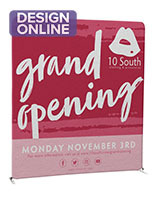 Increase your daily sales and attendee traffic into your booth with eye-catching table cloths. The table cloths allow you to dress up your table easily and quickly with no tools required! You don't need any pins, staples or clips to hold the table cloth onto your table! 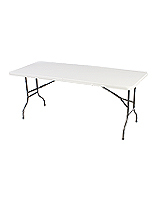 Made from a 100% Poly-flex material, these table cloths fit snugly to your table by going over the feet of the table. These table cloths are wrinkle-free, machine washable and flame retardant. We sell these table cloths in an 8ft. size, with full color and front dye sub printing as well. 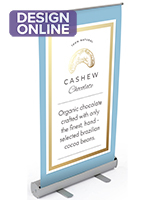 Present your company image professionally with these table cloths!